Oxford, England: Isis Audio Books, 1993. This is the Isis Audiobook version of The Ghostway, read by George Guidall. This edition consists of 5 cassettes in a plastic case with a full listening time of 7 hours and 25 minutes. 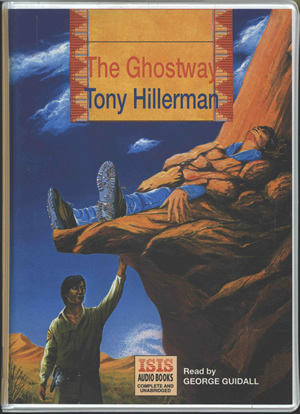 The front of the case is made up of a large illustration by Kevin Feeney of a man lying supine on a ledge, his torso covered with rocks, while a Navajo Tribal Police officer stands with left hand raised toward the figure on the ledge. The title and author's name are printed in a centered yellow rectangle at the top of the drawing. At the bottom of the drawing is the Isis Audio Books imprint and the reader's name. On the back of the case, a centered black and white photograph of George Guidall is printed above his brief biography and a synopsis of the novel. The publisher information and copyright notice are printed at the bottom of the back.